FOUR years of planning and hard work for Tom Allard and Marty Speller came to a very successful conclusion in April when more than 300 BI people arrived in Penang for the Spellard 2000 Reunion. Almost certainly the largest gathering of former company men since BI was absorbed into P&O, the reunion was arranged so that everyone had plenty of time to meet friends as well as enjoy the official and 'unofficial' getherings which were arranged across the five days. The Rasa Sayang resort, embracing both the Rasa Sayang and the Golden Sands hotels next to the beach at Feringi, was the venue. Predictably, the round bar next to the beach developed a natural gravitational attraction for BI types. 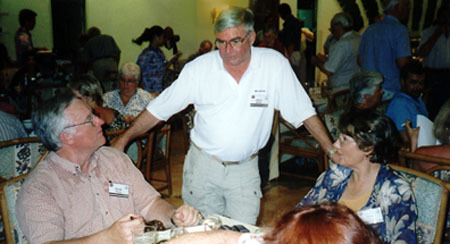 Three official events were planned for the week - a 'welcome' cocktail reception, the reunion dinner and dance, and the farewell barbeque. On top of that were a number of other 'unofficial' gatherings, including Gulf Ds, a "Kilindini" party for the east and South African mob, Rajula, Aussie Bs and Cs, Chantala and a golf tournament. There was a partially successful attempt to recreat an old Chindwara photograph with the same 'cadets' now several decades older. 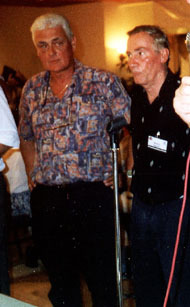 Penang was chosen by Tom and Marty as it was a crossing point for many of BI's routes and was known to a lot of people in the company. It is also a beautiful island and an ideal holiday destination for relaxing in the sun. Many of the Eastern Service people got themselves back to the Hong Kong Bar in Georgetown to reminisce and cast their eye over the books recording all the ship visits. At the main dinner, an auction of BI memorabilia raised more than RM9,000, which was donated to a local charity. The money went towards a heart fund to finance surgery in Penang for Cambodian children. 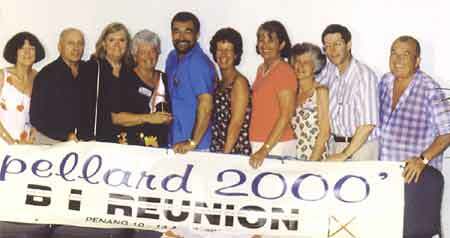 ....and the BIg question now is where will the next reunion be held?